In Assassin’s Creed, you play as Desmond Miles, voiced by Nolan North (Uncharted, Dark Void, Prince of Persia), in 2012, who is forced by the shady Abstergo Corporation to enter the Animus - a device which reads and displays the genetic memory of users' ancestors - and replay the life of ancestor Altaïr Ibn-La'Ahad, an assassin during the Third Crusade. 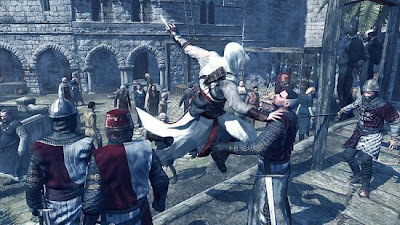 Beginning the game, Altaïr attempts to stop crusader Robert de Sable from taking an artefact from Solomon’s Temple, but in doing so breaks the tenets of the titular Assassin’s Creed, resulting in him being demoted to novice assassin status. Brotherhood leader, Al Mualim, assigns Altaïr the task of assassinating nine targets in order to regain his former status. These men are all Templars, the sworn enemies of the Assassin’s, who are trying to claim control of the Holy Land. Through his assassinations, Altaïr realises that each of the Templars were searching for Pieces of Eden - ancient, mystical objects that give the user unthinkable power - similar to the one that Robert de Sable attempted to lift from the tomb. Uncovering more about the Templars’ plan, and their intended use of the Pieces of Eden, make up a key part of the plotline. I found it interesting to discover that, while the disclaimers may say otherwise, a lot of the game, such as the locations and characters, are actually based on historic fact. There are also sub plots about the Bleeding Effect, where Desmond begins seeing things in the real world due to his time as Altaïr, and the mysterious Subject 16 who leaves cryptic messages around the testing centre. You do get time out of the Animus, although admittedly only normally after completing an assassination, and you can explore the Abstergo lab and interact with cold-hearted head scientist Warren Vidic, and his kinder assistant, Lucy Stillman. However, the majority of the time you will be playing as Altaïr. Assassin’s Creed is an open-world game, so you can pretty much do what you like. There are three cities to explore - Jerusalem, Damascus and Acre – and the town of Masyaf, where Assassins’ Headquarters is located, as well as transitional areas, with winding paths that you must follow between cities. To speed this process up, you can take a horse and gallop through, and, rather helpfully, your horse will follow you around when on foot, so you won’t have to look far for him. Unfortunately, you can’t take your horse into the city, which would have been a lot of fun, but I supposed it was a sensible choice by the developers considering the chaos it would cause. On horseback you still have access to some combat manoeuvres, and can knock down guards by charging into them, scare them off by rearing, or simply slash at them with your sword as you ride by, which is quite effective if you can pull it off. Otherwise, you’ll be wandering through the bustling busy streets on foot. Your interaction with the crowds is very well done, and knocking into them causes visible effects. Your actions are classed as either low profile, or high profile, with the default being low as you are encouraged to be stealthy. Low profile does what it says on the tin, and helps you maintain a low profile while exploring the streets; low profile actions include Gentle Push, which helps you slip between civilians without causing a fuss, and Blend, which makes Altaïr blend in with the crowd, concealed from the eyes of the city guards. High profile is more action orientated, and includes different attacks, sprinting, and free running. 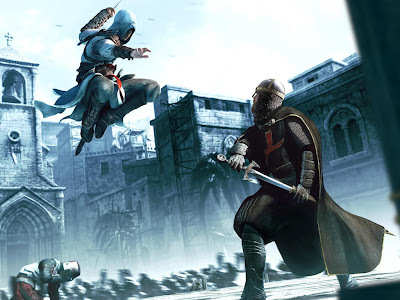 Assassin’s Creed’s key feature is its parkour, and it really is impressive stuff. The controls are very simple: hold down R1 to stay in high profile, and then hold down X to sprint and free run. 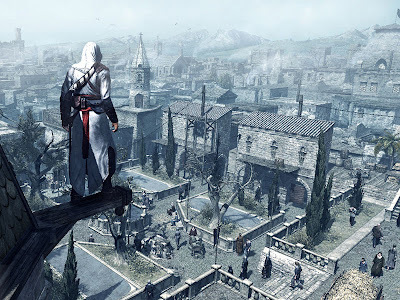 Simply guiding Altaïr with the left stick will allow you to scamper gracefully over the rooftops, bouncing between platforms and ledges, swinging from poles and leaping through trader’s stalls. Thanks to the excellent animations, which are extremely smooth and have no visible transitions, the free-running is not only a pleasure to perform, but looks brilliant too. Watching closely as Altaïr scales buildings, you are able to see each of every one of Altaïr’s nine fingers and his trademark stump of a ring finger grasp onto the ledges; each foot and hand is in perfect alignment. The auto-pilot approach to the free running may not appeal to everyone, but it takes the focus off of precisely manipulating Altaïr and onto path finding, which, for me, made the parkour experience that much more enjoyable. For those times that you’re unable to escape your pursuers, Altaïr can fight back with different sword techniques that are as simple as the parkour to control: hit L1 to lock on to an enemy, and strike with square, holding it down to increase the power of the attack. The combat gains more depth later on, having unlocked more moves and abilities, where you will be introduced to countering and stepping which are key to fighting off enemies. The animations are, again, outstanding here and they have a great, solid effectiveness to them, especially the cinematic finishers, however, yet again, the simplicity may be its downfall in the eyes of some who might find it just too easy. Performing these high profile actions increases the alert status of the city guards: they have three states of alert, depending on how subtle you are being, which are represented by a traffic-light system in the upper left corner of the screen. Normally guards are in an ‘unaware’ state, and offer no threat, but performing high profile actions, such as climbing walls and sprinting around, will cause them to become ‘suspicious’. If they witness you killing somebody, or see you suspiciously close to a body, they will become ‘informed’ and will chase you down and try to engage you in combat. Additionally, if you’ve just assassinated an Al Mualim-designated target, the alert becomes a City Alert, and all guards in the region will join the hunt for you. To lower your alert level again, you need to get out of the guards’ line of sight and hide, either in a hay cart, a roof garden or on a bench between other civilians. As long as the guards don’t see you enter your hiding place, they won’t find you, and it’s simply a matter of waiting until the alert level is lowered again. With all this free-running and getting in to sword fights with guards, Altaïr does get hurt, and Assassin’s Creed operates a health bar system, albeit not in the traditional sense. Your health is represented as the ‘synchronisation’ between your actions and the true actions of Altaïr; getting injured, as well as killing innocent civilians, will cause you to lose synchronicity and a full de-synchronisation will force you to reload at a previous checkpoint. Synchronisation regenerates over time, and maintaining a full sync-bar allows you to use Altaïr’s ‘Eagle Vision’. Eagle Vision highlights important people, such as enemies and targets, in different colours, which make it easier for you to differentiate between people in a crowd, however it can only be used in first person and only when standing still. To counter this, those that were highlighted while in Eagle Vision still have a reduced amount of highlighting on them when looking normally. 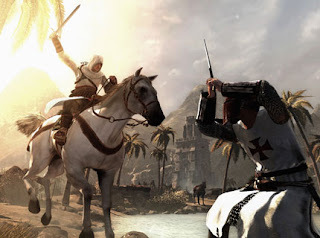 If you complete the game’s primary story missions, you’ll be tasked to assassinate a significant Templar figure. Players have some freedom of choosing their next target, often being given two targets at once, in different cities, so you can decide which one you will go after first. Having travelled to the city, you will need to go the Assassin’s Bureau, which serves as a safehouse for you, and is where you will come before and after each assassination. The Assassin agent in the bureau will give you minimal knowledge of your next target, and you are then required to gain more information before you can be given permission to perform the assassination. To gain intelligence on your target, you will have to complete a couple of side quests which are generally Pickpocketing, Eavesdropping, Interrogation or an Informer mission. Pickpocketing involves observing an exchange of a letter, before following the courier and taking it from his pocket, but you have to be careful not to attract his attention. Eavesdropping requires the least effort of all four mission types, and simply requires you to sit on a nearby bench and press triangle to listen to their conversation, while it is interesting to hear the information if you’re following the plot closely, many players will find these sections dull. Interrogation involves following somebody and beating the information out of them, however I had some problems with this where the person I was following would just walk back in a large circuit to their starting position for no apparent reason. In the Informer missions, an informer will agree to give you information as long as you perform a task for them, which will always be collecting flags via free running, or stealthily assassinating a couple of targets; these missions are the trickiest of the four, but also the most fun. There are other secondary objectives which you can complete, which aren’t necessary for story progression, but will aid the thorough player. You can save civilians from brutality at the hands of the city’s soldiers, which results in vigilante civilians coming to your rescue when you’re being pursued or attacked, and there are also a large number of flags to collect and Templar soldiers to assassinate, which unlock additional Animus memories once enough have been accumulated. When you’re getting close to the assassination time, you’ll see a scripted ‘cut-scene’ in which you are often forced to witness atrocities being performed by your targets, presumably to prove that these men deserve to die. ‘Glitches’ in the Animus system sometimes appear during these sections, allowing you to change the camera angle to a more cinematic view temporarily, if you can hit a button in time. Once you’ve assassinated your target, you talk to them briefly before they die, learning about their involvement in the Templar plot. Returning to Al Mualim, you will be rewarded with new weapons and abilities, and a new target. I haven't mentioned graphics yet, simply because this game doesn’t need amazing graphics to stand out - but it does. Obviously, considering how old this game is now, it isn’t going to claim the graphics throne, but it does look very good. As I previously mentioned, the animations are silky smooth, and on top of this, the draw distance is pretty far: looking out from the cliffs and seeing the entire city sprawled before you for the first time was breath-taking, and it doesn't seem to get any less so no matter how many times you see it; you’ll be wanting to scale the game’s tall View Points (which update your map) again and again. And talking of View Points, you can jump straight off them, performing a signature Assassin’s Creed Leap of Faith, only to land in a hay cart. Unrealistic? Maybe, but it’s great fun. Unfortunately, despite the solid gameplay mechanics and an intriguing plot, Assassin’s Creed isn't perfect. It’s let down by its repetition of mission types, and the overall linearity of the storyline which is merely masked by the game’s open world setting. Each assassination is also very similar: you begin by visiting the Assassin’s Bureau to receive some brief information on your target; then, you go out into the city to collect more; then you return to the bureau and get permission to perform the assassination. On top of this, the side quests that you need to complete in order to get your intelligence are very repetitious. While I didn’t find the repeated style of the missions too bad, many will find the repetition tedious. Ubisoft obviously wants you to take the stealth route, and creeping around on rooftops can be a lot of fun, however, it is just far too easy to run in, stab, and get out. Both this method and the stealth method result in you being on City Alert, with every guard in the district on your tail in seconds, but doing it stealthily takes much longer to get the job done. Perhaps Assassin’s Creed’s strangest downfall is Altaïr’s inability to even touch water: falling in the sea will cause an automatic desynchronisation, which is particularly irritating during the sections where you have to traverse narrow walkways over water only to get blindsided by a powerful sword blow and thrown into it. Producing a new IP is always a risking move, but choosing to green-light Assassin’s Creed is perhaps one of the best risks Ubisoft has ever taken. 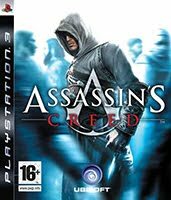 Looking back now, we can see that Assassin’s Creed did have its flaws, but without it we would never have had the superb Assassin’s Creed II and Assassin’s Creed: Brotherhood, or the upcoming Assassin’s Creed: Revelations. Overall, the intuitive free-running, excellent crowd mechanics, jaw-dropping city vistas and a hard-hitting combat system make this a memorable experience that you will be eager to return to, but the repetitive missions, Altaïr’s incapability to swim, and the fact that the open world structure of the game merely conceals the linearity pulls this down from the blockbusting action-adventure title it should have been. Having said that, the game is nearly 4 years old now and very cheap; if you’re into Assassin’s Creed or if you’ve yet to try the series, I strongly recommend picking this one up.